I have been operating The Hammer and Tongs blacksmithing business in Ontario since 1987, and I have taught courses in blacksmithing and knife making as well as performed many demonstrations for the public. These blacksmithing classes are well received by all partcipants. A large part of my current work is custom wrought iron work for customers in southern Ontario. Another area of interest for me is building air hammersand gas forges as blacksmithing supplies for the smithing community. These forging hammers allow a small one man shop to be competive in a mass produced world. I previously used blacksmith coal but now have switched over to propane almost exclusively for my blacksmith forge. Most of my work is done on a double horn European anvil. The quality of the tool shows in the quality of work. Through the ages the blacksmith has had many roles to fill. He was a tool maker, a weapons maker, and an artist. Today the role of the blacksmith has not changed but I prefer to concentrate on the art work. Since I first discovered the art of the blacksmith, some 20 years ago now, I have tried to educate people on the details of this remarkable profession. Each blacksmith student gets a dose of my philosophy of how the metal behaves and what can be accomplished with it. Customers discover the beauty of the forged steel as well as the practical nature of the finished piece. The smithing craft, I find, is based on subtlety not on brute force. I am always coaxing the ironwork to shape, not forcing it. It is more of a gentle persistent process than an aggressive one. 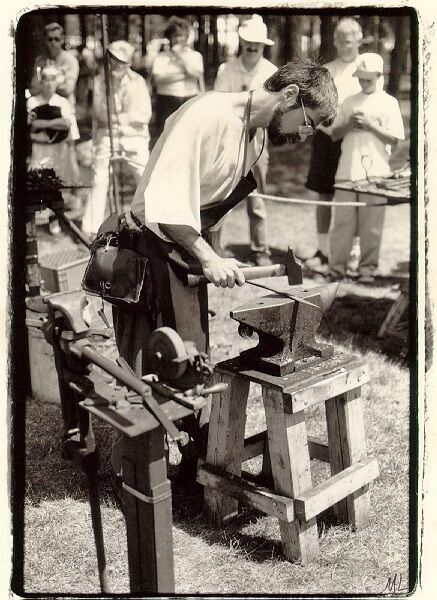 Look through the following pages and discover another facet of the blacksmithing craft.